Former professional basketball player Dennis Rodman spoke out in an exclusive interview with ABC News about his recent trip to North Korea, suggesting that he is partly responsible for the reclusive nation's release of American college student Otto Warmbier, who died last Monday, just days after being medically evacuated from a North Korean prison. "I was just so happy to see the kid released," Rodman told "Good Morning America" co-anchor Michael Strahan of when he first learned of Warmbier's release. "Later that day, that's when we found out he was ill, no one knew that. We jumped up and down ... Some good things came of this trip." Warmbier, who was released on the same day that Rodman arrived in North Korea for a brief visit, was sent back to the U.S. in a state of unresponsive wakefulness, according to doctors at the University of Cincinnati Medical Center. The University of Virginia student was detained by North Korea for nearly 17 months following his January 2016 arrest in Pyongyang, for allegedly trying to steal a propaganda poster while he was visiting the country on a sightseeing tour. Despite Rodman's belief that he had something to do with Warmbier's release, a Department of State spokesperson has said that Rodman had nothing to do with Warmbier's release, according to the Associated Press. Warmbier's father also said in a statement to ABC News that "Dennis Rodman had nothing to do with Otto returning to the United States." Chris Volo, Rodman's agent who accompanied the athlete on his trip to North Korea, told ABC News that before they went, "I asked on behalf of Dennis for his release three times." "I know being there had something to do with it," Volo said of Warmbier's release. "Because when I was organizing the trip ... and I meet with the delegates here, you know, I addressed ... Otto Warmbier. And I said to them, 'we...would need his...you know, a release, some type of good faith, if we're ever going to do some type of future sports relations ... They said they understood." Rodman said he wished to "give all the prayer and love" to the Warmbier's family, adding "I didn't know that he was sick." Volo added that they have contacted the family and are hoping to meet them, "but we were told that, you know, it just couldn't happen." The two-time NBA Defensive Player of the Year said he didn't meet with North Korea's leader, Kim Jong-Un, during his most recent visit. "The previous times we did," he added. "I think the fact that, you know, my trips going up to North Korea is more like trying ... to get to communicate sports-wise. It ain't about trying to release people." "It's not trying to do ... political stuff. It's almost just trying to reach out for sports and see if I can bring sports to North Korea," Rodman said. Rodman also discussed how the country has changed over the course of his visits, saying "we've seen a lot of changes," including "the fact that it is so modernized now." "When you go over there, and you hear the radio, and ... people are talking," Rodman said. "They're so happy now, because it's more like ... it's civilized again." Rodman, who calls North Korean leader Kim Jong-Un a friend, said, "people don't see ... the good side about that country. It's like going, like, to Asia. It's like going to like Istanbul, Turkey, or any place like that. It's pretty much just like that. You're know, you going to see some poverty. You're going to see some people that's not doing too well." "I think people don't see him as ... a friendly guy," Rodman added of the country's dictator, adding "if you actually talk to him" you would see a different side of him. "We sing karaoke," Rodman added of his relationship with Jong-Un. "It's all fun. Ride horses, everything." "It's the politics that's the bad thing. If we can try to figure something out, just open the door," Rodman suggested, saying that he believes "if Donald Trump had a chance," he would fly to North Korea "and try to make peace." Rodman, who identifies as a Trump supporter, also called on the president to join him in creating peace with North Korea. "I'll ask him right now. Donald, come talk to me. Let's try to work this out. Because you know what? I get nothing out of this. The only thing I get is out of pride for my country, America. I love America," Rodman said. "But I want these two sides to get together and try to figure something out. Some dialogue. That's it." "I think the next time we go, I think it's going to be in August. I think the fact that when ... I sit there and talk to him ... he'll throw comments out there," Rodman said of Kim Jong-Un. "You know, he'll say, 'I want three things, Dennis, from you, if you can do this for us.'" 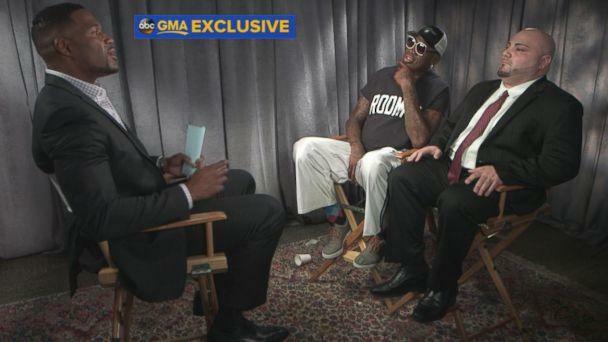 Rodman said that his message for former President Obama was to ask him to "move his ships." "He said, 'There's just one thing I, I, would love for ... Obama to do,'" Rodman said of his conversation with Kim Jong-Un. "He said, 'I would love him if he can move his ships...away a little bit.' That's the one thing he asked me. He said, 'If he can do that, I think we can have some new positive.'" Rodman said that he is not going to North Korea for attention, saying, "I don't need to be on TV." "What am I getting out of this? I'm going over there out of my kindness of my heart just to try to help. Just to open the door ... a little bit so we can have [a] talk," Rodman said. "I'm spending hundreds of dollars just to go over there to try to just open the door a little bit," Rodman said. Rodman said despite the widespread criticism and backlash that he has faced for his trips to North Korea, "I think it's worth it."